Initially going with placeholder sketch art, but I intend to do a proper graphics pass later. The goal is to create various trees and plants. 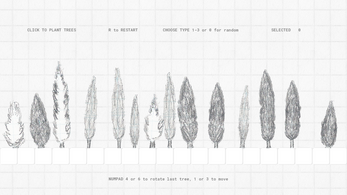 v1 - Starting with simple vertical trees (cypress): click to plant 1 of 3 variations with random length and shape, built from base, mid and top segments. v2 - Added tree trunks and made it so whole tree can be rotated or moved with all parts to allow for more flexible placement and dynamic movement. v3 - Added random segment variations to increase variety + other tweaks. v4 - Made trees scale-independent, resize & angle with mouse or KB. To start with the intention is purely to build systems that can generate trees for my own project Hellas, but it could possibly be expanded to be used by others in the future.